Description: This dramatic variation on the classic Pronghorn Hunter shows the influence of knives by Mastersmith Ed Fowler. 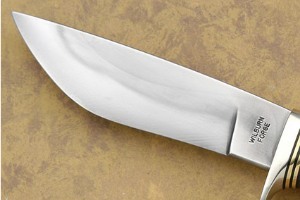 The drop point blade was differentially heat treated, bringing the edge to critical temperature then oil quenching three times. Many thermal cycles and normalizing steps assure consistent grain structure. 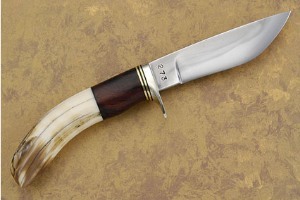 The blade was then tempered at 400 degrees twice, for exceptional durability. A cryogenic treatment between tempers enhances the edge holding ability. 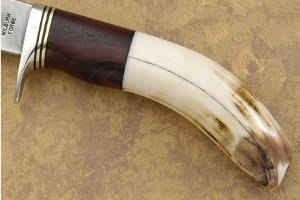 The handle is formed from a solid section of hippo tooth and is nicely shaped to comfortably fit in the hand. 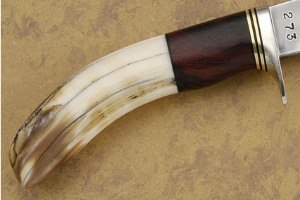 The cocobolo spacer provides contrast. Alternating brass and fiber spacers assist the handle to adjust to temperature and humidity changes. 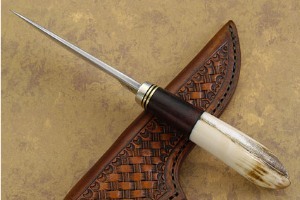 The handle feels so natural in the hand, you’ll have a hard time putting it down. 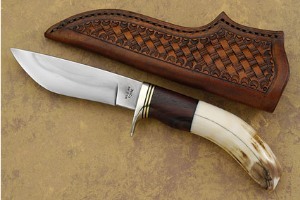 A serious field knife for the avid hunter or collector. 0.02734375 0.01171875 27.34375 11.71875 Header Started. 0.27734375 0.15234375 277.34375 152.34375 Trailer Completed.